The first thing I did this morning (after turning my alarm off 5 times... Seriously!) was to check the Topshop website. I'm not sure why. There was no motive. I was just sleepy, confused and that made sense at the time. It's so pretty! Look at it! It's got a little lace collar and a blue china print and a little keyhole back. I'm so in awe that I forgot how to use connectives correctly. I got a little free magazine with it too and I had a free bag sitting in my basket which was very exciting. However, when I went to check out, somebody had swiped the last bag out of my basket. How annoying! I always thought items in your basket were untouchable until you were timed out. Never mind. The Erdem top is mine and that's all that matters! This is all thanks to London Fashion Week, you see. Topshop are celebrating 10 years of NewGen by collaborating with 20 of their past NewGen recipients. What's more, £7 from each sale goes to Centrepoint, a charity that helps homeless young people towards a brighter future. Designers collaborating include Meadham Kirchhoff, Christopher Kane and, of course, Erdem. Seriously, I want all of them. Give them to me! 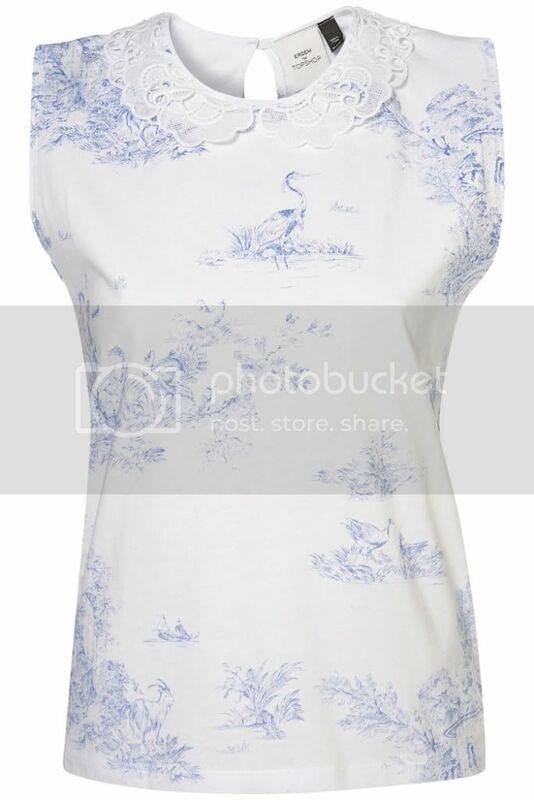 I love this top, I have always admired erdem, I can't wait to see more pieces from their collab with Topshop.